Whether it is the look of the drink in its glass, the aromas your nose detects, the flavors on your tongue, the mouthfeel as you drink, or the sound of the bubbles bursting (maybe that last one is a stretch) there is no doubt enjoying your favorite beverage is a highly sensual experience. To help you increase your enjoyment, people in the industry have developed a wide array of glassware to accentuate the strengths of each beverage. So before you grab a bottle of your favorite beer, wine, or spirit, take a moment to think about the glass from which it is best experienced. Given the great diversity of beer styles in the world, it is rather remarkable that beer glasses did not begin to diversify until the early 1900s. Since then, the industry has exploded with over a dozen major types and countless more slight variations. Specific breweries have even begun crafting their own beer glasses engineered to make their brews even better. The traditional American pint glass is the most common piece of beer glassware in the United States and is the iconic, standard beer glass shape. It has thicker walls, is easy to stack, and can be used with just about any style, which makes it ideal for bars and restaurants. Due to being a full 16 ounce pint, however, it generally is not used with high alcohol by volume (ABV) beers. Compared to the American pint glass, the British imperial pint glass is 20 fluid ounces, bulges out near the top, and is referred to as having a nonik shape. The bulge is there for improved grip and prevents the glasses from sticking together when stacked. Like American pint glasses, the British imperial pint can be used with just about any style of beer, but typically it is not used for high ABV beers. A third type of pint glass that deserves to be called out is the pint glass developed by the Boston Beer Company for their Samuel Adams Boston Lager. More commonly referred to as the “Sam Adams glass,” this glass is the one displayed in the brewery’s commercials for their Boston Lager. Sam Adams markets their Boston Larger as a harmonious, balanced beer, and the glass is designed to emphasize the beer’s strengths. It features a heavy base that is laser-etched to increase bubble nucleation and has thicker glass at the base to resist warming from the drinker’s hand. Near the top the glass opens to a bowl shape meant to collect body and aroma, and the lip has a rounded “turbulator” intended to disturb the beer as it rolls into your mouth, releasing additional flavor and aroma. It is a one-of-a-kind glass that does enhance the flavor of beer and, though designed specifically for their flagship lager, can be used with any balanced beer. Tall, sleek, and delicate, pilsner glasses are designed to showcase the color, clarity, and carbonation of a beer. Unlike the weizen glass below, pilsner glasses are perfectly straight with no curvature, angling slightly outward from base to top. It is most commonly used with American lagers, bocks, pilsners, or blonde ales. Similar in style to a pilsner glass, a weizen glass is tall and noticeably wider at the top. Typically it is of sturdier construction and bows outward in the upper half to create a slight bowl shape. It also has a curved lip at the rim. The weizen glass is designed to showcase volume while creating a strong, pillowy head on top of the beer. It is best used with wheat ales, weizenbock, dunkelweizen, and pretty much any other beer with “weizen” in the name. The tulip glass has a medium-length stem and, unsurprisingly, is shaped like a tulip. It narrows in the middle and is slightly narrower at the top than the bottom. At 12 fluid ounces per pour, the tulip is frequently used with strong, bold beers with high ABV and are great at capturing the heavy body of the beer while still displaying clean foam and heady aromatics. A stunning glass with a classic name and regal shape, the goblet is typically used for heavier beers such as dark ales, Belgian IPAs, Dubbels, Tripels, and Quadrupels. It is rounded and bowl-like with a stem of variable length. Some are heftier while others are more delicate. Among the most versatile glasses, a snifter can be used for almost any kind of boozy beverage. It is often overlooked as a beer glass but, holding around 13.5 fluid ounces of gorgeous grog, is perfect for dark ales, heavy stouts and IPAs, or any beer with a strong aroma and high ABV. The snifter has a short stem and wide bottom that narrows at the top and provides a deep bowl, which is ideal for swirling and stirring up the volatile compounds that give your beer, brandy, or other beverage its enticing aroma. The thistle glass is a modified tulip glass which, in the vein of the tulip, resembles the shape of the flower after which it is named. The thistle is the national flower of Scotland, and thusly the thistle glass is frequently used to serve Scottish ales. One of the funkier looking glasses, the IPA glass has a narrow, almost tube-like, base that measures around an inch-and-a-half at its narrowest point before opening up into a three-and-a-half inch bowl-shaped core. The narrow base is designed with ripples, which enhances hop-forward IPAs by sufficiently agitating them with every sip, preserving the frothy head and enhancing both taste and mouthfeel. A truly different style, the shape of this glass pushes beer volume and aroma upwards towards the main bowl and provides a unique drinking experience. The stout glass is identical to the IPA glass in nearly every way, except the tube-like base is smooth without any ridges. The mug or stein is a heavy, handled glasses that is more about form and less about function. Though it came into popularity because of its durability, able to take a beating while being washed repeatedly, today that is less of a concern with the advent of dishwashing technology. Still, the mug is great to show your personality and have fun while drinking with friends. If I asked you to picture someone drinking medieval grog, what image comes to mind? If you are like most, you probably imaged a mug-like glass with a handle. If so, you imagined a tankard. Tankards generally come with lids affixed via a joint near the handle and historically are made of silver, pewter, glass, wood, or ceramic. Not to be confused with the champagne or sparkling white wine flute, a beer flute has the same signature shape but is shorter and a little stouter. The beer flute showcases carbonation and color and is best used with lagers, lambics, or red ales. Similar to a Collins glass, described below, a stange glass is slim and cylindrical with think walls and a sturdy base. It is typically associated with German-style beers and is perfect for light-bodied brews such as pilsners, bocks, and lambics. Used for samplings and tastings, a pony glass is typically a quarter-pint and can look like a short Collins glass or a truncated weizen glass. It is frequently used on brewery tours and in bars or restaurants that serve beer flights. The opposite of a pony glass, the yard glass is quite literally a glasses that is one yard long. It can hold around two-and-a-half pints of beer and has a sturdy, bulbous base leading to a long, narrow neck and a wide mouth. It serves as a great novelty glass and historically has been used for traditional pub drinking games. The half-yard is the same style as the yard glass except it is one-half the length. Not all wine glasses are alike. Below are some of the major varieties, though even within the red and white wine categories there are slight variations designed for specific varietals. In general, red wine is bigger and bolder than white wine. Because it is served at warmer temperature, it also tends to have more robust aromatics. As a result, the red wine glass is usually bigger, taller, and wider, ideal for swirling. This shape gives the wine more surface area and ensures the wine comes in more contact with the air. Within the red wine glass category are Bordeaux and burgundy glasses. The Bordeaux glass is taller with smaller bowls designed for heavier wines, directing each sip to the back of the tongue where its bolder flavor can be most enjoyed. The Burgundy glass is shorter and wider, which helps the wine fall onto the front of the tongue where the lighter, more delicate flavors can be detected. Similar to red wine glasses above, there are slight variations among white wine glasses. 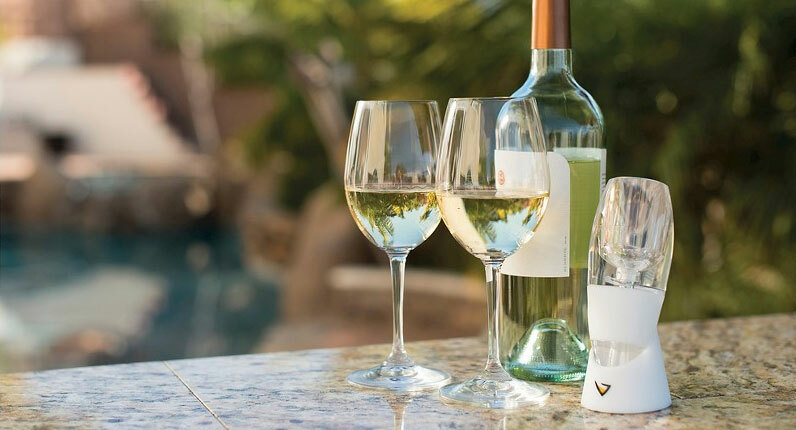 Overall, the white wine glass is shorter and smaller than the red wine glass, designed to help the wine maintain its cooler temperature. Depending on whether the wine is young and sweet or mature and complex, the glass will either direct the sip more towards the front or the back of the mouth, respectively. Increasingly today we see the emergence of stemless wine glasses. This glass can have the same range of styles and intended uses as the red and white wine glasses described above, however, the stemless glass is quite visibly different as it does not have a stem. Long, slender, and elegant, the flute glass is designed to showcase the fizziness of sparkling wines. Its narrow shape helps retain and direct carbonation upwards and allows for small, savory sips. Not to be confused with the flute glass, a cordial glass is intended for dessert wines such as ports and sherries. This glass is smaller than the other wine glasses due in large part to the high alcohol content of dessert wines, and it tends to direct the wine towards the back of the mouth to prevent the drinker from cringing at the wine’s overwhelming sweetness. Just like beer and wine glassware above, there is a stunning variety of glassware for different liquor-based drinks from elegant, classy cocktails to rugged, classic mixed drinks. The shot glass comes in a variety of shapes but typically holds one serving of liquor, or about 1.5 fluid ounces. You can either drink directly from the shot glass, or frequently they are used in place of a jigger to measure out liquor for a mixed drink or cocktail. Short, typically sturdy, and cylindrical or slightly bent upwards and outwards, the rocks glass is one of the more traditional liquor glasses. It comes in a variety of shapes and sizes, generally holding between six and eight fluid ounces, though some range upwards of 13 to 15 fluid ounces. Taller with either a completely cylindrical shape or a short-stemmed base giving way to a cylindrical shape, the highball glass holds eight or nine fluid ounces and is designed for highball drinks. By definition those are iced drinks with liquor and either water or a carbonated beverage. This glass can also go by cooler glass or slim jim glass. Slightly larger than a highball glass, the Collins glass holds around 10 fluid ounces and is straight-sided, cylindrical, tall, and narrow. It is used for the Collins family of beverages, such as the Tom Collins, and other drinks best served in a narrow glass. A champagne glass that is the opposite shape of a flute glass, the coupe has a long stem and bowl-like appearance. It is elegant and typically holds between four and eight fluid ounces. One of the many types of cocktail glasses, the martini glass is stemmed with a cone-shaped top. The shape allows the drinker to hold the stem, keeping their warm hands away from the chilled beverage, while the wide mouth opens up the drink’s aromatic elements. The margarita glass varies in shape but is generally a play off the coupe. Typically long-stemmed with a bowl-shaped top (compared to the cone-shaped martini glass), the margarita glass has utility beyond the beverage, even functioning as a salsa or guacamole server. Shaped similarly to the tulip glass described earlier, the hurricane glass is a short-stemmed glass with a slightly bulbous base that narrows near the top before opening up again at the mouth. Holding 20 fluid ounces, it is frequently used for frozen beverages and mixed drinks, such as the Piña colada and Blue Hawaii. A cousin of the hurricane glass is the poco grande glass, which is shallower but has a longer stem and holds just 12 fluid ounces. Unsurprisingly developed specifically for absinthe, the absinthe glass features a short, thick stem with a reservoir-looking bulb at the bottom to indicate the correct pour level. This reservoir design is of the Pontarlier style of glass. Above the reservoir the glass opens up into a larger, delicate bowl. The grappa glass is a style of glassware designed specifically for the beverage of the same name. Grappa is a liquor with high ABV that is produced in Italy, San Marino, or the Italian part of Switzerland. The grappa glass is almost like a combination of a flute glass and a tulip glass. Designed with drinking whiskey in mind, the Scotch whiskey glass looks like a cross between a snifter and a tulip glass. It has a short, wide stem and bowl-like base that narrows slightly to the mouth. This shape helps concentrate the aromas before directing them upwards toward the mouth and nose with every sip. A small glass with a narrow stem holding just two fluid ounces, the sherry glass is created for liqueurs and aperitifs. It is similar to a cordial glass but has a wider rim and a sturdier design. Around 12 fluid ounces and also metallic, the Mint Julep cup is also designed for the beverage after which it is named. With straight sides that expand slightly towards the top, the metallic make of the Mint Julep cup adds to the cooling sensation of this refreshing mint drink. Made of metal with a copper finish, the Moscow Mule mug is designed for the drink after which it is named. The copper construction allows the chilled beverage to have an extra cool sensation, which adds to the enjoyment of this iconic 1950s drink.